Classification: With skills based exclusively on her combat training, Cat is classed only as a Warrior. History: Cat is an outstanding member of the Superpower Union. As she had no natural super-human abilities, she tirelessly works to keep herself in top physical condition. She first came to the Union’s attention when she was a homeless girl stealing to survive, where they saw her potential and recruited her to join them in their fight to save the multi-verse. 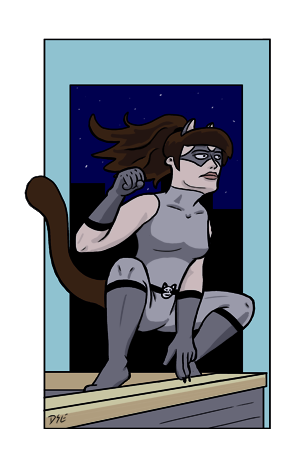 After turning her back on a life of crime, she quickly proved herself a model superhero… even if she has a short temper. After a series of departures, Cat was made leader of the Local 1400, and has had her hands full trying to reign in the groups wilder elements.